Struggling to cook enough rice for your large family. Consider easing your work load and get an extra large family rice cooker. The Kitchen Genie – 45 Cup large family rice cooker is great for large & extended families, parties and even small scale catering. Cooking rice is usually time consuming especially for a large family. To achieve good quality fluffy rice where the grains do not stick together requires constant attention to ensure the rice is cooked properly, and not burnt. An electric rice cooker automates the process by controlling the heat and timing. This means a heating element is freed up on the cooking range that would otherwise be occupied for rice cooking. A rice cooker does not necessarily speed up the cooking time but it does reduces the cook’s involvement in the process, freeing the cook up to prepare and cook other ingredients. Plus it produces the right texture and perfect results every time. If you follow the instructions. Once you have a large family rice cooker you merely have to measure the rice and add the correct amount of water. Inside the inner bowl of the rice cooker there are usually graded marks etched on to indicate the quantities of rice. Once the rice cooker is set to cook, the rice will be cooked with little further attention. Never worry about stirring, burning or monitoring again. The Kitchen Genie Rice Cooker range starts at the affordable handy 1.8 Litre – 10 cups model, then the medium family model at 2.8 Litre -16 cups and goes up to the much larger extra large big family model of 5.6 Litre -45 cups. The model shown is the extra large family deluxe rice cooker – 45 cup capacity which is ideal for those big extended family meals or parties. Very few manufacturers make a large family rice cooker. Kitchen Genie is one of the few. A large deluxe rice cooker by Kitchen Genie. 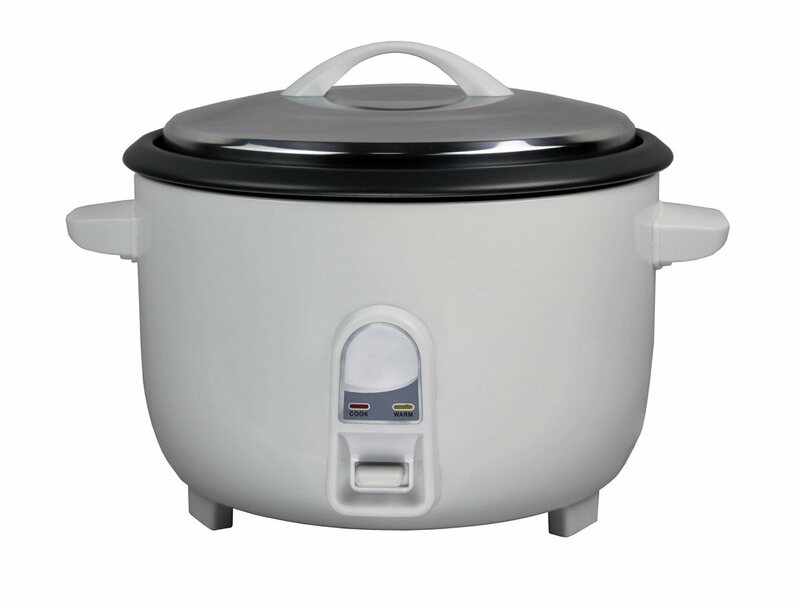 To help you decide on which size of rice cooker you need see our blog page:- Medium, Large or Extra Large Rice Cooker – Which size do I need?